Hello darlings! It’s that time of the year where glitters and shimmers are everywhere! From clothing, to eye make up looks and of course nail lacquers. SinfulColors came up with these 22 must-have radiant holiday hues that are perfect stocking stuffers and definitely would go with any outfit you have in mind for the upcoming parties! My obsession with nail polish actually started with SinfulColors. I started collecting them fours years ago. The quality and lasting power are comparable with other brands. For two dollars a bottle, you cannot go wrong. 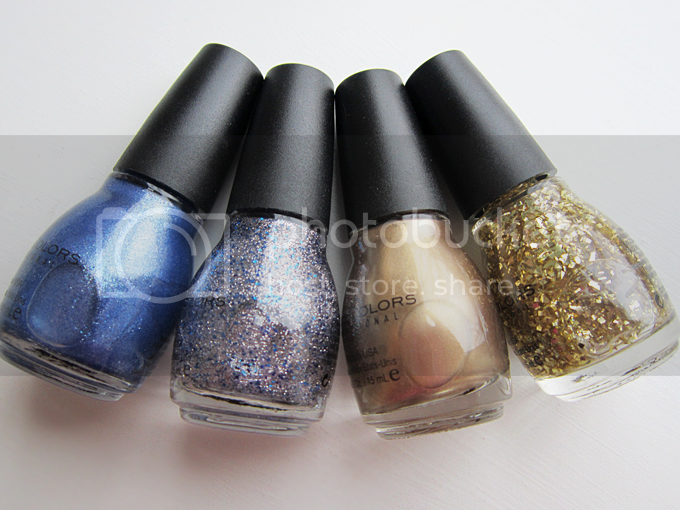 I have four shades from their holiday collection to show you and I hope you like them! For all the swatches that I’m showing you, I needed two coats for Gold Medal and three coats for the glitter polishes to achieve the opacity I wanted. They were very easy to work with and drying time was pretty quick. The glitter polishes were a little hard and messy to remove but I was already expecting that. To be honest with you, I really like the quality of SinfulColors nail polish. They’re pretty amazing, definitely a bargain! Ice Blue is a soft indigo exploding with silver sparkle. This shade is beautiful! First thing that comes in my mind by looking at this shade is “Cold Winter Night”. It’s definitely wearable for both day and night. For a softer look, apply one to two coats. For a night out with friends, you can build up the color to your preference. Just be careful because it can get clumpy because of the glitters. 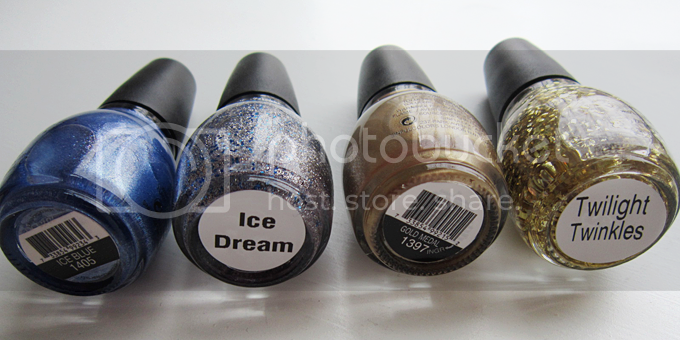 Ice Dream is a cerulean glitter with a translucent silver base. This definitely scream holiday and winter! My most favorite from the collection. When I saw it just even from the pictures, I said “I need that in my life!”. I love everything about it. The name, base color, glitters, it’s gorgeous! This looks good alone but would definitely make dark colors look so amazing if you top it of with this. Gold Medal is the perfect metallic gold! I picked this one because I don’t really have a lot of nail polish with metallic finish. I thought it wouldn’t compliment my skin tone but surprisingly, it didn’t look bad. Make sure to use a good top coat to perfect the finish. Twilight Twinkles has brilliant flakes of gold! This would definitely go with a black nail polish. It would look so effortlessly classy! SinfulColors did really good with this one. It’s not a cheap looking glitter flakes, it’s gorgeous! I really love all the shades that I picked from their beautiful holiday collection. I cannot wait to try the eighteen other shades *lol* This collection really boost my holiday spirit! Let me know in the comments below which one is your favorite, and if you’ve tried any or the other shades. Xoxo! The SinfulColors Holiday collection is available for $1.99 each exclusively at Walgreens for Holiday 2014. DISCLOSURE: The products mentioned in this post were sent by SINFULCOLORS.COM for review purposes. All opinions are my own and 100% honest, editorial samples do not, in any way, affect the outcome of product reviews.